Headline Do Minimum Wage Increases Decrease Number of Employed? I am a scientist, but aren’t we all. There isn’t any other way of verifying knowledge. So anything we learn should be subjected to scientific investigation (skepticism) to see if it’s accurate. We all use science every day of our lives, whether we realize it or not. Every time we troubleshoot a broken product or try to figure out why something is happening, we are scientists. I am a skeptic; and we all should be. We don’t have to argue philosophy to be skeptical. We do have to ask questions like “Why is that true?” and “Is that true?” We can also be skeptical in our normal lives. Skepticism isn’t just a philosophy, it’s a lifestyle. If we question religion or science or philosophy or anything, why don’t we question our choice of ice cream or soda? Do we spend our hard-earned money on an inferior movie? Do we waste those calories on an inferior hot fudge sundae (with respect to Larry Niven). 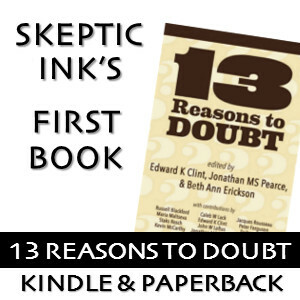 We use skepticism not only to find out things, but to make our lives better. I am a teacher; and all are, whether we realize it or not. We don’t have to stand in front of a classroom (though I’ve done that). Every time we speak or write or communicate, we should realize that other people will read our statements and we may be subject to the same skepticism that we apply. Is everything we say true? I try very hard to make sure that everything I say is both true and verifiable. We don’t have to lie and make up stories and myths to speak gently and with compassion. I am a dad; and if you haven’t tried it, you should. Dad doesn’t mean contributing genetic material. Dad means being a part of a life. Instilling a child with ethics, courage, intelligence, wisdom, and curiosity. I’m not the best dad, but at least I’m there, doing my best, every day. I am an atheist; and everyone ought to be. I’ve been thinking about religion for a long time. I was raised Southern Baptist and slowly became agnostic. Then I realized that agnostic was just an atheist who didn’t want to admit it. Can I be wrong and there be a God? Sure. Is it likely? No. Kid, I’ve flown from one side of this galaxy to the other. I’ve seen a lot of strange stuff, but I’ve never seen anything to make me believe there’s one all-powerful Force controlling everything. There’s no mystical energy field that controls my destiny. Anyway, it’s all a lot of simple tricks and nonsense. Of course, in the real world, Han is right. Nothing has ever been seen to support any religious belief. I am a geek; and that makes me special. I was a geek before it was cool. I was a geek when we were looked down upon. I play the games, I read the books, I watch the movies, I wear black t-shirts and jeans year round. I could name all the dinosaurs at the age of 5 and I watched the original run of Cosmos when I was 8. Being a geek is another life-style choice and one that works for me. I would like to lay claim to being a writer, a biologist, a paleontologist, an inventor, an artist, and a bunch of other things. But, while I do these things (or have done them in the past) I’m not an expert by any means. I’m a jack-of-all-trades and master of none. I’m a generalist in a world that prizes specialists. I spend more time looking for the thing I want to do than actually doing anything. You may be thinking, what a load of horse-hooey. That doesn’t tell us anything about me. It may not, but I need to tell you that everything I’ve said is accurate and it’s taken me a long time to get this far. It really takes a lot of introspection (and a lot of skepticism) to look at one’s self with that kind of magnifying glass and not gloss over the bad stuff and amplify the good stuff. I haven’t stated the bad stuff, but I know what it is and that’s more than most people are willing to admit. I hope you stick around and get to know me. I’m always interested in hearing thoughts and opinions and listening to people point out where I’m wrong.